MVYouth scholarshop winners, from left to right: Nic Andre, Coltrane Leport, Sam Bresnick, Emily Hewson, Shannon Levesque, Marisa D'Antonio, Rose Engler, Evelyn Medeiros, Meghan Sawyer. Nine Martha’s Vineyard high school seniors will receive more than $660,000 in scholarships from MVYouth, the community fund announced this week. Seven students will receive money to attend four-year colleges and two will receive funding for workforce development scholarships. In 2017, MVYouth piloted the workforce development scholarships focusing on supporting career-bound graduates. This year’s scholarships went to Shannon Levesque, who will attend the Massachusetts Maritime Academy, and Evelyn Medeiros, who will attend the Massachusetts College of Pharmacy and Health Sciences. 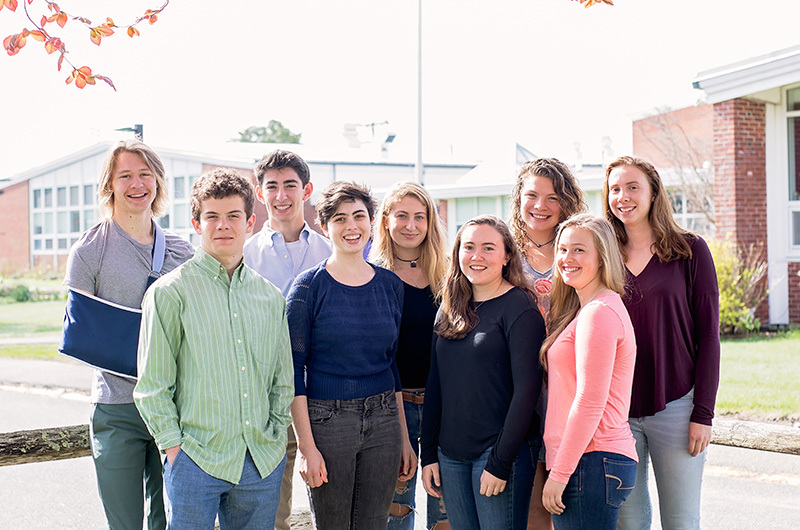 The college scholarship winners are Nic Andre, who will attend Holy Cross College; Samuel Bresnick and Marissa D’Antonio, who will attend Boston College; Rose Engler, who will attend Brown University; Emily Hewson, who will attend Bennington College; Coltrane Leport, who will attend Hobart & William Smith College; and Meghan Sawyer, who will attend Colgate University. All the students are seniors at the Martha’s Vineyard Regional High School. The scholarships offer last-dollar funding to students who lack sufficient funds to attend their school of choice. The scholarship winners were chosen from an original pool of 42 applicants, and narrowed down to a pool of 12 semifinalists using merit as the principle criteria, the organization said in a press release. MVYouth was started in April 2014 by Daniel Stanton and Jim Swartz, both seasonal residents of Martha’s Vineyard. With the support of 68 founders who have each pledged $25,000 per year for four years, the organization will disburse nearly $1.9 million in 2018 between its two programs: expansion grants and scholarships. In February, more than $1.2 million in expansion grants was awarded to Martha’s Vineyard Community Services and the Martha’s Vineyard Museum. For information about the programs, visit mvyouth.com.